It’s comfortably the largest car that Infiniti makes – but does that also make the QX80 one of the best? In spite of the mad rush by many car makers to get a compact crossover in their ranges, there’s still a lot of demand for large, luxurious SUVs. In fact, it’s hard to think of any premium car maker that doesn’t offer a large 4x4 model nowadays, with Audi, BMW, Cadillac, Land Rover, Lexus, Mercedes-Benz and Volvo all offering their own spin on this car type. 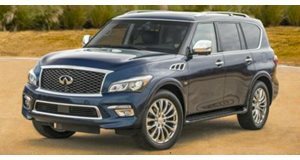 Unsurprisingly, then, Infiniti also has its own gargantuan ‘soft-roader’ in the form of the huge QX80, complete with a giant V8 gasoline engine and availability in an eight-seater configuration. It’s certainly an eye-catching car in the flesh and on the spec sheets, but does that mean the car’s as domineering as a day-to-day vehicle? The Infiniti QX80’s cabin is finished to an appropriately premium standard. As expected from a car this high up the pecking order, the Infiniti QX80’s cabin is finished to an appropriately premium standard. Though the design and control layout is perhaps starting to look a little dated now (the QX80 has been in production since 2010, after all), there’s no denying the Infiniti’s interior is well crafted out of high quality materials, and the multifunction steering wheel controls do alleviate some of the quibbles we have with some of the more fiddly buttons on the center console. Overall comfort levels are pretty good in the QX80, too. The front seats especially offer lots of bolstering and lumbar support, and the middle row of seats in the standard QX80 models offer decent amounts of leg and head room all round – though it’s worth pointing out that the third row of seats is far more lacking in this regard and, as with the optional middle seat in the second row, adults may find the third row to be a bit tight on shoulder room. Things do start to improve for the Infiniti when you fold down all of the rear seats. As with the seating space, overall cargo carrying ability does become more and more restrictive in the Infiniti QX80 the further you go towards the rear of the car. We have no qualms at all with the storage spots up front (the large glovebox and deep door bins get the thumbs up from us, and middle-row passengers in the standard QX80 get quite a few cubby holes in the fixed arm rest, but overall trunk space is rather limited when you have all the seats in place – at 16.6 cubic feet, it’s about average for the seven-seater SUV class. Things do start to improve for the Infiniti when you fold down all of the rear seats. Flip the third row and second row seat backs forward, and you’ll have 49 and 95 cubic feet to play with respectively in the QX80 - for comparison’s purposes, a Volvo XC90 has a maximum capacity of 41 and 85 cubic feet in the same categories. 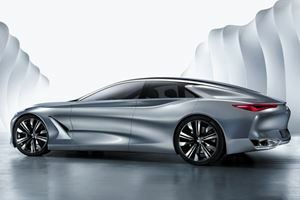 Those seat backs in the Infiniti also fold away completely flat and, as is the case with almost every large SUV on the market, getting heavier items in and out is made easier by the load lip that’s flush with the trunk floor. In spite of the huge alloy wheels and the car’s vast bulk, the QX80 remains stable and controlled over rougher road surfaces. The type of person who buys great big SUVs like this don’t necessarily care that much about driving dynamics. Sure, the likes of Porsche and BMW have proven with their Cayenne and X5 respectively that cars of this ilk don’t have to be lumbering behemoths, but it would be foolish to suggest that chassis balance and point-to-point performance are necessary attributes to have in a seven-seater crossover. As a result, you’ll more often than not find giant SUVs to be far more adept as long distance cruisers – and the Infiniti QX80 is no exception to that well. In spite of the huge alloy wheels and the car’s vast bulk, the QX80 remains stable and controlled over rougher road surfaces, with the suspension doing an incredibly good job at isolating the occupants from jolts and crashes over the likes of potholes, expansion joints and manhole covers. Factor that in with those cushioned seats and some impressive levels of noise insulation, and you’re left with a car that works superbly as a long distance cruiser (especially if you specify the optional hydraulic suspension system). The Infiniti QX80 is also okay in built-up areas. 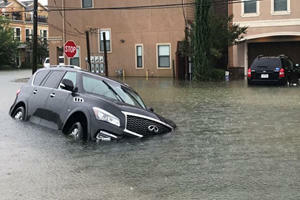 The Infiniti QX80 is also okay in built-up areas. For obvious reasons, this behemoth of an SUV isn’t the easiest car to thread through city traffic and tighter parking spots, though the light steering, good forward visibility and an array of standard fit manoeuvrability assists (namely the the front and rear parking sensors and Around View camera system) do at least make up for some of the QX80’s drawbacks in this area. What isn’t especially well alleviated is the atrocious rear visibility, with the chunky rear pillars in particular resulting in sizeable over-the-shoulder blind spots. Though it is mitigated at lower speeds by those aforementioned parking sensors and cameras, it does result in the Infiniti’s only real drawback on the highway: a difficulty in judging where the cars behind you are when you’re pulling out of your lane. You can specify blind spot monitoring systems on the QX80, but doing so will increase the list price of an already pricey car by another $2,500. If you’re looking for the best fuel economy in this class, you won’t find it in the QX80. It’s safe to say that, if you’re looking at cars like the Infiniti QX80, you’re relatively flush with cash – and, as such, can afford the often exorbitant running costs that are associated with vehicles of this size. But that doesn’t mean we can’t expect some degree of efficiency from our big SUVs, and we’re sad to say that the QX80 is comfortably one of the least frugal SUVs you’ll find in this class. With claimed fuel economy figures of 20mpg on the highway and just 14mpg in the city, the Infiniti QX80 is disappointingly inefficient. Even a Land Rover Ranger with the 5.0-liter supercharged gasoline engine matches the Infiniti in the city-based fuel economy category. Put simply, if you’re looking for the best fuel economy in this class, you won’t find it in the QX80. The transmission and the engine are beautifully refined too, further strengthening the Infiniti QX80’s cruising qualities. Which is a shame, as it’s the only area where the Infiniti’s engine is demonstrably inferior to the competitors. 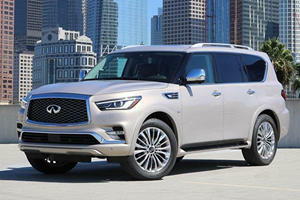 For instance, as expected from a 5.6-liter eight-cylinder engine with 400hp and 413lb/ft of torque on tap, there’s a lot of pulling power on tap (Infiniti claims the QX80 has a maximum towing capacity of 8,500lbs), and the slick-shifting seven-speed automatic transmission means acceleration remains brisk and seamless. Both the transmission and the engine are beautifully refined too, further strengthening the Infiniti QX80’s cruising qualities. Surprisingly, sticking with the standard rear-wheel drive setup or specifying the optional all-wheel drive system has no penalty on fuel economy. Neither system has a huge impact on the overall power delivery of the QX80’s big gasoline engine either, and the low-by-SUV-standards ride height means adding all-wheel drive won’t suddenly make the Infiniti a Jeep Grand Cherokee-rivaling trail runner. As a result, we’ll let you decide if the extra traction the all-wheel drive system will provide in slipperier conditions is worth the $3,100. To get the most comfortable QX80 that’s possible, you’ll need to invest more than $13,000 into the car. Much like its distant and considerably smaller cousin, the Nissan Murano, the Infiniti QX80’s big USP outside of the optional eight-seater configuration is the asking price. With the range starting at $63,250, the Infiniti is roughly the same price like-for-like as a Lincoln Navigator, and substantially cheaper to purchase initially than, say, a Cadillac Escalade, Land Rover Range Rover, Toyota Land Cruiser or Lexus LX. Further reinforcing that value proposition is the QX80’s solid residual values – though they’re not projected as being better than, say, a Toyota Land Cruiser’s or Cadillac Escalade’s, it is worth pointing out that the price premium of those cars does offset that resale figure slightly. Plus, as with the MSRP, the Infiniti does just about pip the aforementioned Lincoln Navigator. Standard equipment levels are also fairly good. All Infiniti QX80 variants come with full leather upholstery, heated front seats, tri-zone climate control, a power-adjustable steering column, an intuitive built-in navigation system, a moonroof, a powered tailgate and the parking sensors/all-round camera system we discussed earlier. Plus, if you desire to have an extra seat or would rather there be more than two chairs in the middle row, then you can delete the middle row’s center armrest in favour of another seating position at no extra cost. It’s when you get to the optional extras and the higher trim levels, however, where the Infiniti QX80’s value-for-money attributes start to become less relevant. On top of the $3,100 all-wheel drive system, Infiniti also charges $2,800 for 22inch wheels (the standard car rides on 20inch wheels), and the only way you can get the impressive hydraulic suspension system is by specifying every single package on offer – meaning, to get the most comfortable QX80 that’s possible, you’ll need to invest more than $13,000 into the car. In fact, the only optional extra we would consider specifying is the Driver Assistance Package. The only trim level on the Infiniti QX80 that does include those ridiculously expensive optional extras as standard is the top-tier Limited trim. However, going for that model isn’t something we’d recommend unless you must have the quilted leather upholstery and ‘unique styling features’ on this spec – not only is it ludicrously expensive at $88,000, but (as you’ve probably already figured out if you’ve got a calculator on hand) specifying the optional extra packages individually will save you at least $9,250. In fact, the only optional extra we would consider specifying is the Driver Assistance Package. Though it is expensive at $2,500, you do at least get enough worthwhile equipment (including, but not limited to, blind spot monitoring, adaptive cruise control, and a pre-emptive braking system that starts bringing the car’s speed down if it detects an imminent head-on collision) that we feel it’s worth the extra outlay. Except, for the time being, we don’t. If you can live with the extra shiny chrome trim pieces and beige interior, you can pick up an Infiniti QX60 ‘Signature Edition’ with the Driver Assistance Package for just $1,000 more than the base version. Until the day Infiniti pulls the Signature Edition from the range, we feel it’s this spec of QX60 that’s the current pick of the line-up. Question is, will it make production this time? Don't be fooled into buying one.